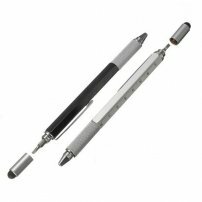 Super 6-in-1 Stylus for iPhone / iPad / Phones with Ball Pen, Ruler, Level Guage, 2 Screwdrivers) : allputer.com - Accessories for all your Portable Electronics & Computers! The 6-in-1 Universal Stylus Pen Combo is a revolutionary stylus pen that is a must-have for IT professionals, do-it-yourself-ers and anyone who likes to be prepared with a couple of handy tools on them at all times. - The tech tool pen comes with 6 very handy functions: A ruler, a spirit level, a ballpoint pen, a stylus, a flat-head and Phillips screwdrivers. - Unique desigh, a valuable pen you worth having for your life and work!